Maybe it’s because I was in Orkney and the Hebrides in September. Or maybe it’s because I read four Peter May novels this year with his dark, broody plots and settings. Or maybe it’s because today is Charles MacIntosh’s birthday, the brilliant chemist who is best known for his invention to protect us from the rain and cold. Or maybe it’s because the moon is hiding these nights and the days are dark and bone-chilling. Or maybe it’s because we lost so many bright lights in 2016. I’m sure it’s a combination of all of the above which have brought me to listen to this wonderful poem by Liz Lochhead over and over today. You can listen here (which I heartily recommend) and read the full text below. and this begins tomorrow with however many minutes more of sun and serotonin. bless us with their long-travelled light. In the quiet after the Christmas rush, when everyone was on their way, I started to hook this landscape. Pulling the wool through linen is so satisfying–the colour and texture entertain part of my mind, while the rest wanders. This is my version of an island near our cottage. The craggy trees and vegetation stand heroically on the bald rock of the Canadian Shield. We are city-bound for much of the winter, but still visit the lake in memory. 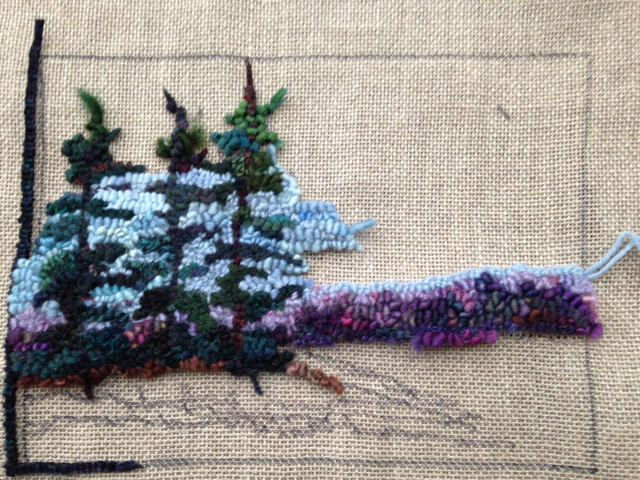 I’m using a balance of wool, fleece and yarn in this piece. I’m determined to use what I have in the baskets in my studio. I want lots of variety for the sky and as I was hooking I thought of my stock of wool and cashmere sweaters, some perfectly felted and easy to run through the cutter. 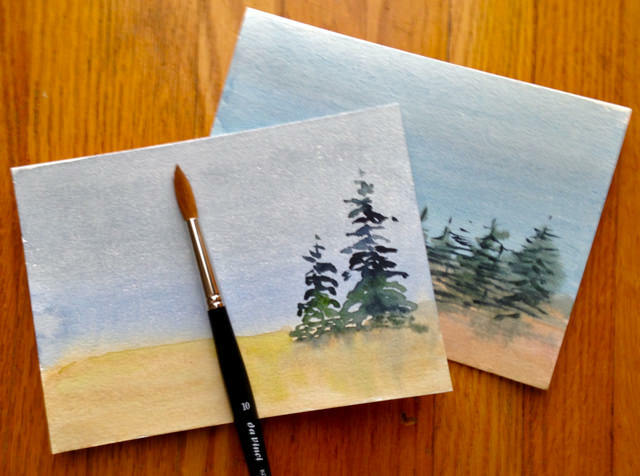 I’m going to add them to the sky and the water–I’ve piled some below. I’ll report back on how they worked out. Merry Christmas to all Birdbrain followers. Here are a couple of Christmas images for you. I’ve already told you how I am going to miss my Page-a-Day New Yorker Cover calendar. This one is from one of my favourite cover artists, Charles E. Martin. Martin died in 1995 and many of his covers were on the magazine in the 60’s and 70’s. I love his buildings and his views of the east coast, and this colorful tree which just might inspire a new Christmas mat! Great texture and composition. 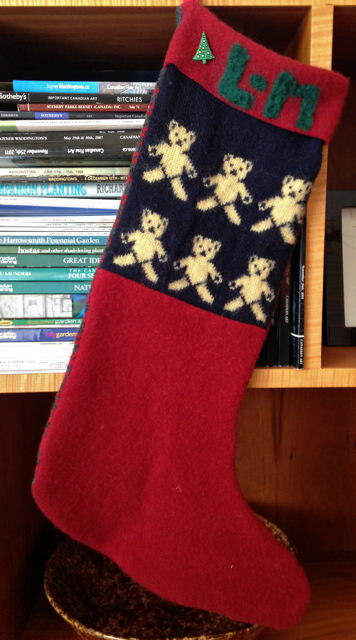 And from closer to home, here is another Christmas stocking, this one for Grandchild #3. I was able to use the last of the Scottish teddy bear sweater which you saw here and here. I wish you all the very best of the season. Very early this morning, as I drove on a slushy, dark highway, I told myself the days are getting longer. We’ve turned the corner. Although it didn’t feel like it this morning, from here on in I know we will have more daylight each day. This is a reason alone to celebrate, not to mention having the family together again. Below are a few of our Christmas things. 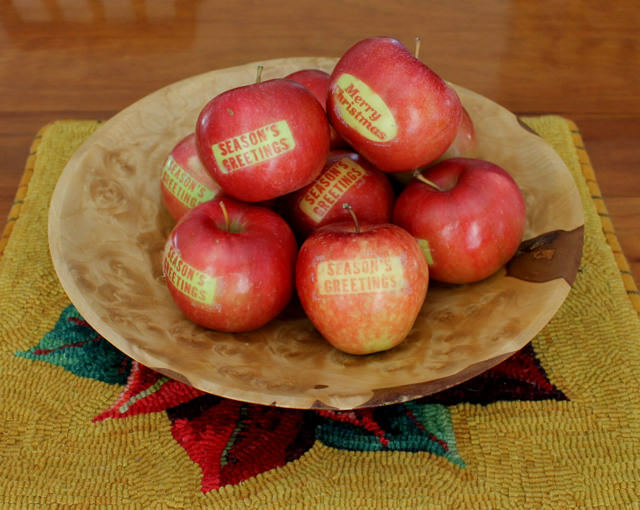 We love to get these apples every year from a nearby orchard. They say local and seasonal in the best way. 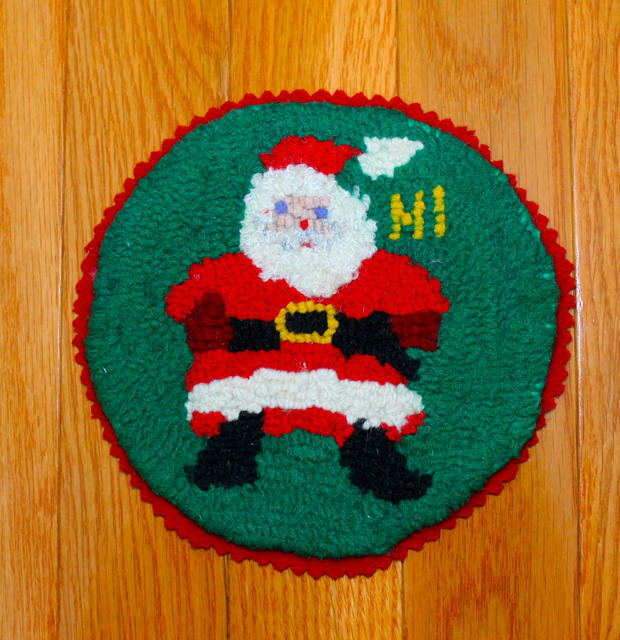 I don’t think I’ve shared this adorable Santa hooked by my mother many years ago. Each year when I set him on the hall table, he makes me smile. 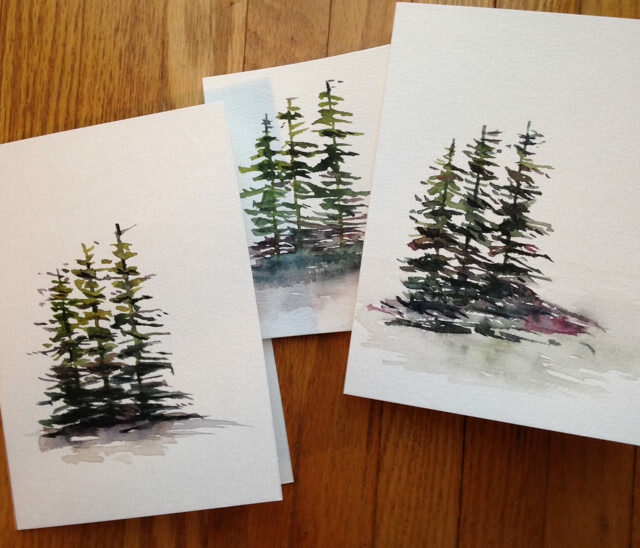 And here are a few of the Christmas cards I sent this year, pictured with my new favourite brush, a #10 Da Vinci sable. 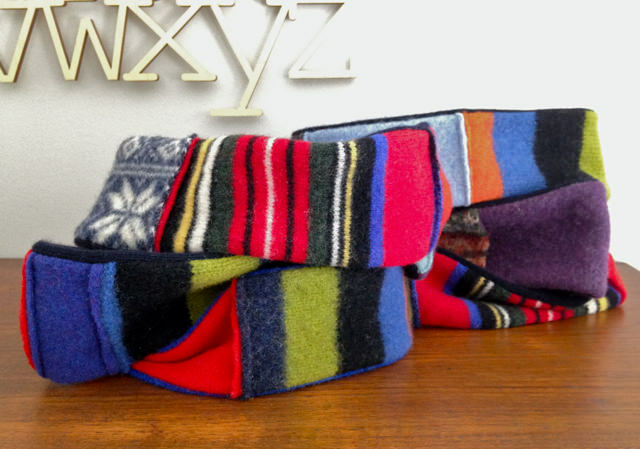 A couple of days ago I posted a pile of headbands which I had made from recycled sweaters. Following that, I had requests for instructions. These headbands are very easy and need no special equipment other than a pair of scissors and an average sewing machine. 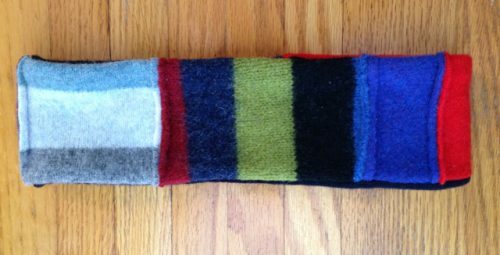 I like the combination of colour and pattern, so I use a variety of felted (washed and rinsed in hot water) sweaters cut in pieces about 3.5 inches wide. 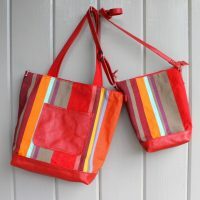 I sew these pieces putting wrong sides together to make a strip which goes around your head comfortably. I then cut a second piece of sweater the same size as the pieced strip and sew this piece to the pieced strip, right sides together, making a long tube. Then I turn the tube inside out, press gently and sew the ends together first with machine and then finishing by hand to make a neat join. 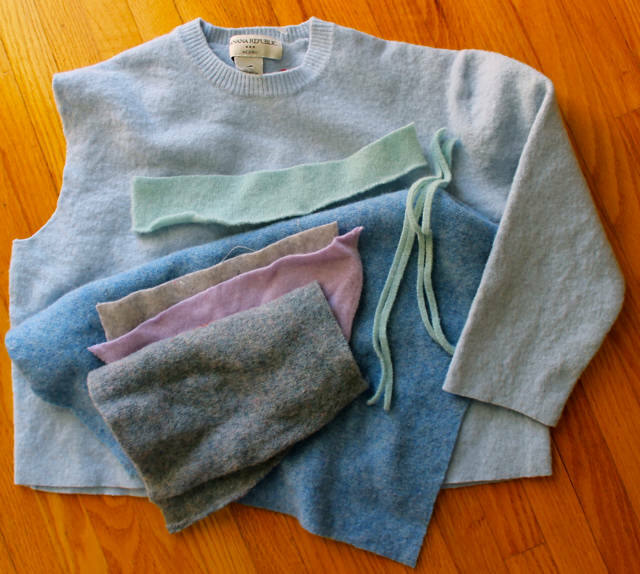 This is a great way to continue to wear your well-loved sweaters which are past their youthful best. 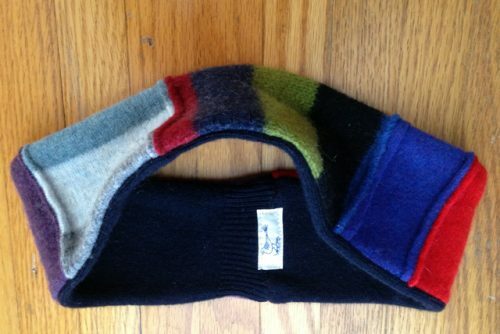 Cashmere, of course, makes the very best headbands, warm and soft. 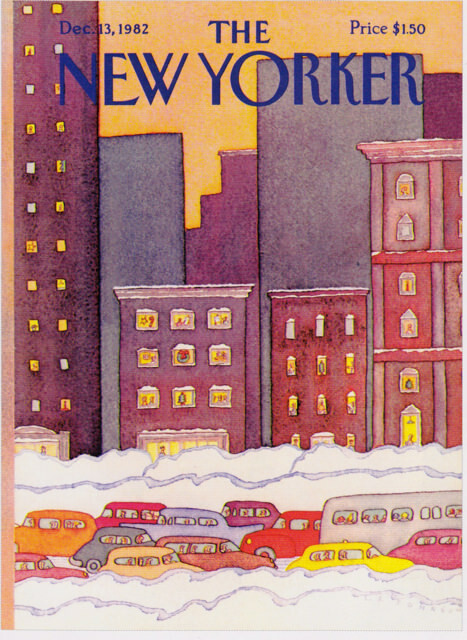 For the last two years I have been enjoying the New Yorker Cover page-a-day calendar. 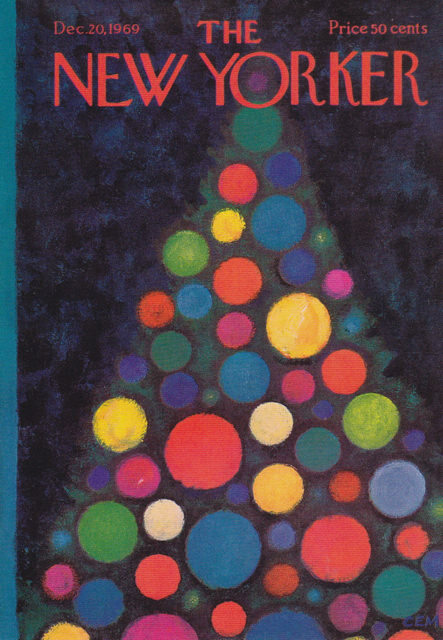 A different New Yorker cover, sometimes from more than 75 years ago, was the highlight of my early morning, along with steamed milk and strong coffee. So I am very very disappointed to learn that there will be no 2017 version of the daily Cover-Calendar. Over the next week or so I’m gong to share some of my favourites beginning with this 34 year old gem by Lonni Sue Johnson. I love watercolour sketches of buildings and this one is particularly charming with the ochre sky and cartoonish cars almost obscured by snow banks. On doing a little research on Lonni Sue, I learned her fascinating story. 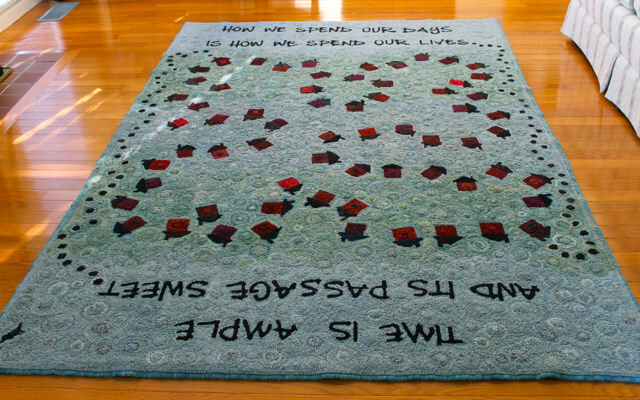 You can read about her anterograde amnesia here and the restorative power of art. 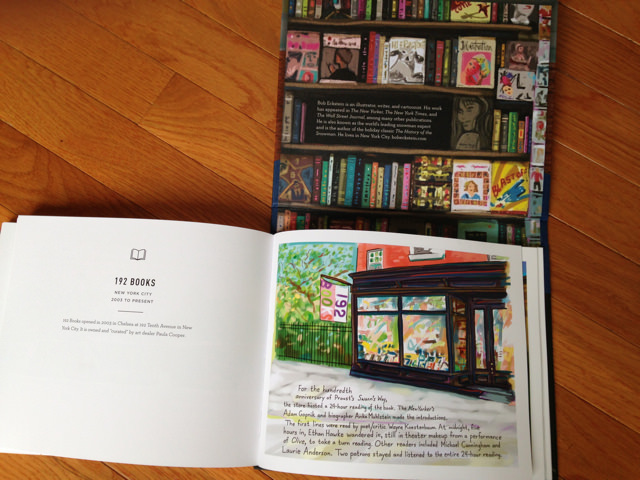 My birthday was a few days ago and I received the perfect book: Footnotes form the World’s Greatest Bookstores by Bob Eckstein. You can find the link to it here. 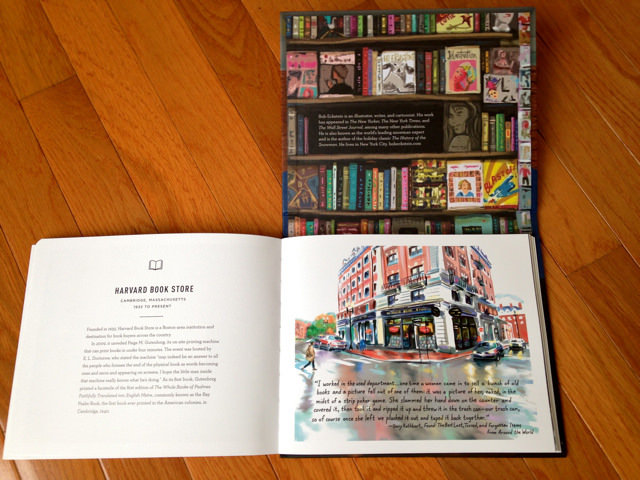 The most delightful sketches of bookstores fill this book as well as ‘true tales and lost moments from book buyers, book sellers and book owners”. 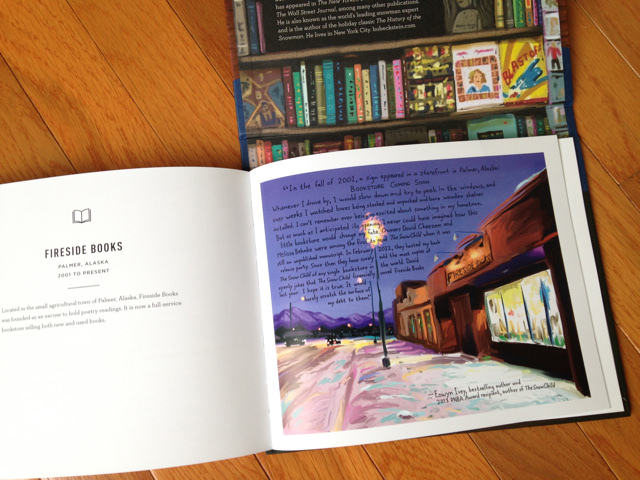 I’m charmed and intrigued by every page. I’ve included some of my favourites below. This is a compact soft cover book inside a hard outer case–not too big to carry with you! 2. Patti Smith’s New Yorker article in today’s online version. I didn’t know that she was asked to sing at the ceremony before it was announced that Dylan had won the Nobel for literature, and that it was her decision to sing Dylan’s iconic song instead of one of her own. It is interesting to hear her describe her experience as well as events leading up to the performance–beginning with her birth 70 years ago this month. 3. Cranberry Pear Conserve. We had a big bag of local late pears which we needed to use. This recipe made 7 jars of a delicious ruby-coloured condiment for poultry or cheese. Our family is limiting our gift-giving this year and keeping it to hand-made or second-hand. I think these jars will be perfect. I find it addicting, fooling around with colour, pattern and texture. 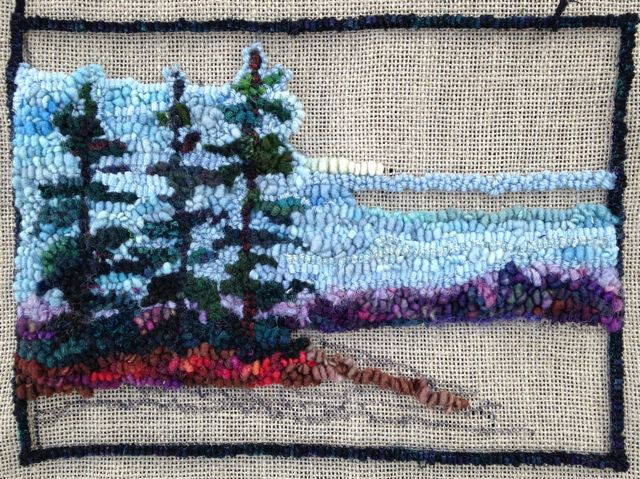 This is, of course, why I love rug hooking. 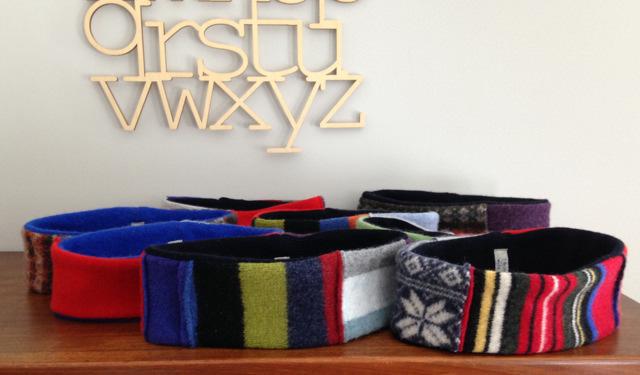 But making these headbands from sweater pieces is also a perfect exercise. I set myself a challenge to make as many headbands as I could in a day, using only what I had on hand. 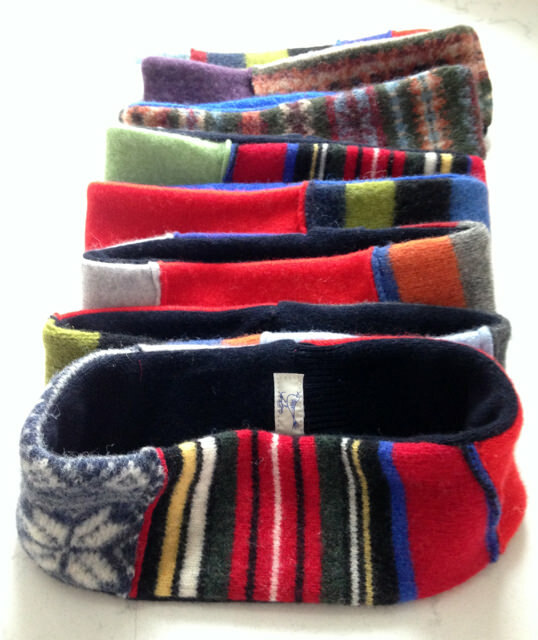 I made headbands a few years ago, backing them with fleece–but I had no fleece in my cupboard. So…I decided to back them with pieces of black cashmere from a lovely old cardigan. Sometimes scarcity produces the best results. 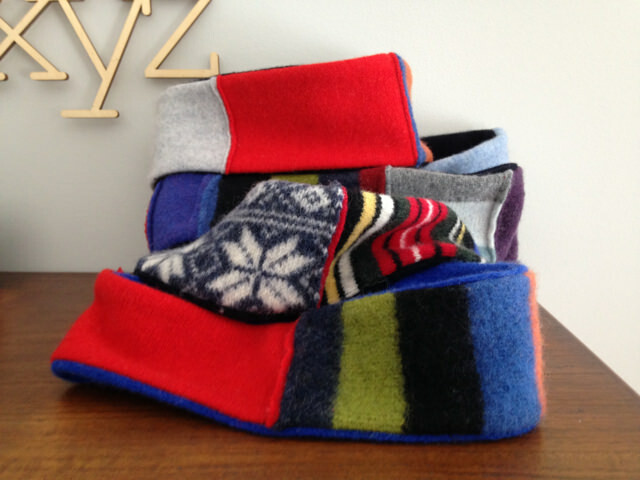 These are super cozy and much warmer than those made with synthetic fleece. The little label that you can see peeking out is one of my vintage handwoven ribbon labels embroidered with a little bird. Perfect. When I completed the whipping on my 5’x7′ rug, Annie, it was only two days before it was to be on display in our local gallery. 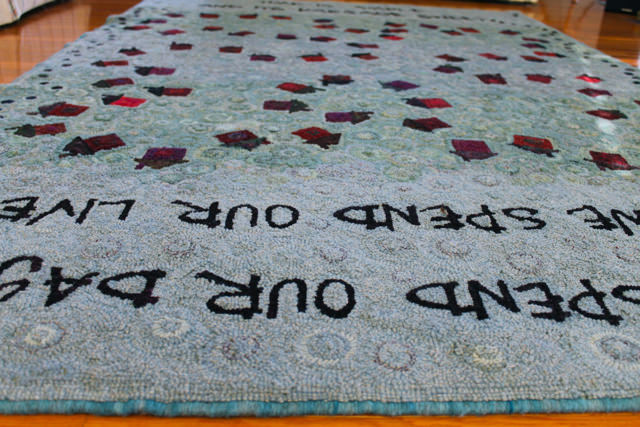 My husband had made a frame to hang the rug on and that is where ‘she’ has been for the last month–on show. Yesterday I did two things. I bought rubber carpet underlay and then went to collect Annie from the gallery. 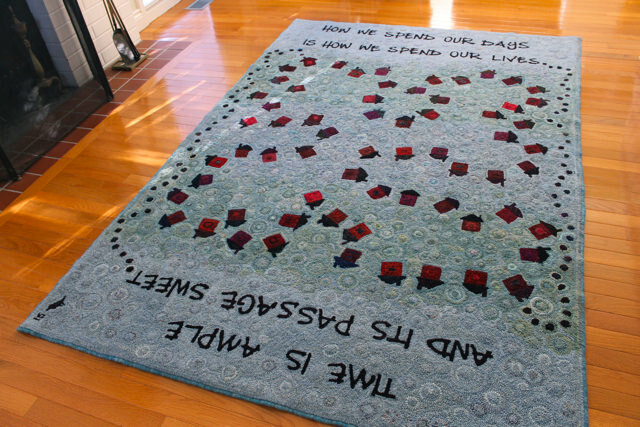 Now the rug is happily in our front room with the Dillard quotation and the 65 houses that span a big part of a lifetime. I hope to enjoy living with ‘her’ for a good while to come. 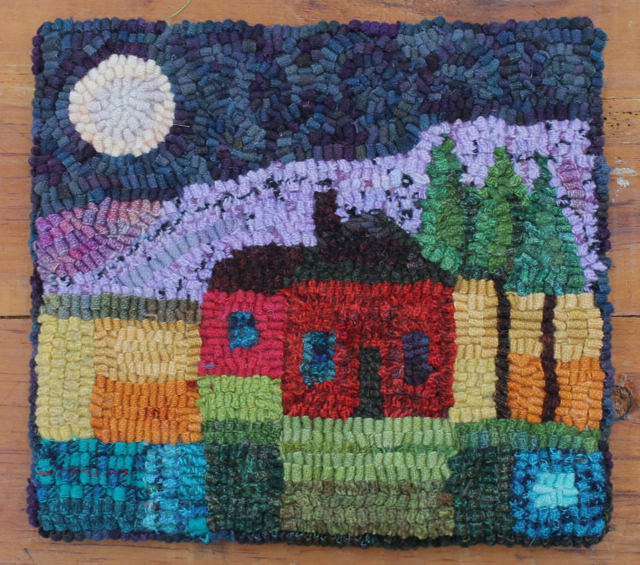 Here is another trivet with night sky and colour blocks. I’m working out a plan for a bigger rug and I find it helpful to do these little pieces to see how value, shape and direction of hooking come together. I then sew a square of recycled wool on the back of the piece to make a trivet which is both functional and a splash of colour on the table.